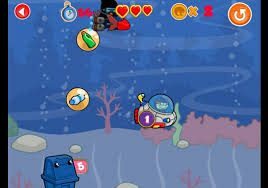 Recycle Hero is a fun and interactive app that teaches children of all ages about recycling and saving our planet through 6 exciting games. Each game has 6 levels that allow players to be a part of the Yogome Squad to fight Evil Queen Ignorantia as she tries to pollute the planet. The object of each game is to clean up and organize trash into the appropriate containers for recycling to gain points that allow players to buy special powers and avatars to use in new levels. This app is more than an entertaining game for children, but is also an opportunity for children to learn about saving our planet. The vibrant colors, innovative scenes, and interactive games are used very well, creating an engaging app for children. The animation in each recycle bin and Yogotar adds interest to the app and makes it feel more like a video game than an application. The graphics are very clear and the transitions from one level to the next are clean and easy to do. The various games, Yogotar illustrations, and added music create a high-quality entertaining experience that both child and parent will enjoy. While this seems to be more of an entertainment app, it also educates children on the importance of recycling and cleaning up our planet. In each game players are taught to separate trash into appropriate containers for paper, metal, glass, plastic, and compost items as a way to save the planet. Children will not only enjoy playing the games, but also learn how to care for our planet along the way. With this app children are able to enjoy playing fun and interactive games to save the planet and also have the freedom to customize their Yogotars with accessories or powers to help them along their adventure. After completing each level players are awarded coins that they can spend buying fun hats for the recycle bins or new ships for the Yogotar and the fun doesn’t stop there. Children will also enjoy playing 36 different levels with more engaging and challenging objectives with each new level. This is an app that will provide endless amounts of fun for children. Recycle Hero is a very high quality app with many games and fun features that is absolutely free. Parents will certainly appreciate an educational and entertaining app that won’t break the bank. This app provides fun for children of all ages and doesn’t require any complex instructions to get started. With a brief introduction video children quickly learn the object of the game and can begin maneuvering through the different levels in no time. The multi-user function ensures that more than one child can play on their own profile and parents have the added benefit of being able to view each child’s progress. Each game is user friendly and fairly intuitive and doesn’t allow players to get stuck one any particular section. There are no advertisements or in app purchase options that distract children from their game either so parents don’t have to worry about unauthorized purchases. Over all this is a great child friendly app.